Thank you for visiting our online shop. “SAKETALK SHOP” (the “Shop”) will sell products on the Shop’s website by accepting online orders from online users (the “Visitor” or “Customer”) and, upon receiving payment of the purchase price, will ship purchased products to the delivery address provided by the Visitor (the “Service”). The following terms and conditions govern the use of the Shop and its Services (the “Terms”). Any Visitor who wishes to place orders with the Shop is asked to carefully read and accept the Terms beforehand. Every first time Visitor to our Shop will be given a temporary shopping cart (the “Visitor’s Cart”). This allows the Visitor to temporarily store products the Visitor wishes to purchase in the Visitor’s Cart. If the Visitor leaves the Shop before creating an Account (defined in Clause 2 below) and being assigned a Member’s Cart (defined in Clause 3 below), the contents of the Visitor’s Cart will be emptied. Visitor’s may create an account by entering and submitting the required account information to the Shop (the “Account”). By creating an Account the Visitor will be able to shop faster, monitor the order status and keep track of previous purchases. The retail price for each product is the price that the Customer is obligated to pay when the Customer sends the Shop a purchase order (the “Order”). 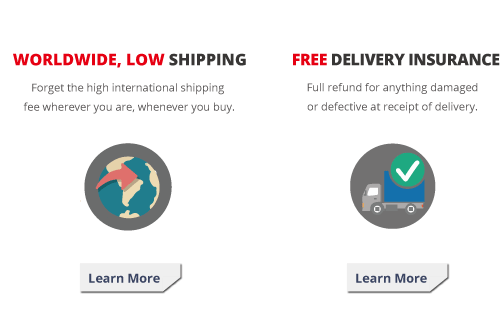 The Customer must also pay all associated shipping costs to ship the product from the Shop’s storage facility in Japan to the Customer’s delivery address. The final purchase price, which includes shipping costs, is displayed in the shopping cart after the Customer clicks “Checkout”. Depending on the law in the country of delivery the products purchased by the Customer may be subject to tax or import duty. The Shop is not responsible for paying any such tax or import duty and is unable to define or pre-collect any such taxes or duties. 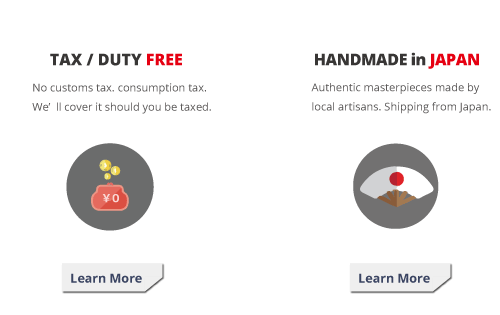 If the Customer has any questions regarding the applicability of tax or import duty on any purchase from the Shop, the Customer should contact the appropriate local customs office before placing an order. The Shop will not declare that any purchased products are a gift or have a lower value than the retail price. Prior to placing an Order for a product, the Customer will be required to enter certain required information on the Shop’s designated web pages and submit such information over the Internet to the Shop. Orders may be placed 24 hours a day. As part of the process of placing an Order, the Customer will be required to confirm the Order on the Shop’s order confirmation webpage (the “Confirmation Page”). On the Confirmation Page the Customer will be asked to review and confirm the Customer’s name, delivery address, shipping method, billing address, payment method, product details and price. The Customer will be able to correct any mistakes or edit choices on the Confirmation Page prior to clicking the “Confirm Order” button. Once the Customer clicks the “Confirm Order” button the Order is transmitted to the Shop, which creates a binding offer by the Customer to purchase the product (the “Order Confirmation”). After the Order Confirmation process is complete, Customers wishing to pay by credit card or PayPal (where offered) will be directed to the secure webpage of the Shop’s payment provider and asked to enter their name, address, credit card details and e-mail address. Customers wishing to pay by bank/wire transfer will not need to follow this procedure and may simply close the browser or return to the Shop. If the Customer does not receive an Order Acceptance E-mail within 48 hours after placing an Order, the Order may not have been received by the Shop. In this case, the Shop requests that the Customer resubmit the Order. When resubmitting the Order the Customer should type “Resending” in the comment box in order to avoid duplicate Orders. By placing an order, the Customer confirms that you fully understand the import regulations and duties in your country. The Customer bears all the responsibility relating to international shipping regulations applying to the item. The product is delivered by Japan Post by EMS (Express Global Mail Service), Airmail, SAL or Surface Mail. The Shop will inform the Customer of the tracking number and other shipping details if applicable on the day of the shipment or the next working day. Some of the delivery methods are not traceable or insured. The Customer is responsible for tracking the parcel using the information provided in the shipping confirmation email. If the parcel is returned to the sender (the Shop) because the parcel’s retention period has expired, the customer shall bear the original shipping costs. To resend the parcel, the customer shall bear the cost for the new shipment. The Shop typically delivers the product within 6-7 business days from the day the Shop has received the payment, unless stated differently in the article description or informed to the Customer by telephone or email. Delivery times will also vary depending on the destination and national holidays in Japan (e.g., year-end/new-year, Golden Week holidays and during the Obon holiday etc.) and in the country of destination. If the product delivered is different from the product the Customer ordered, or the product is defective, or the Customer does not like the product, the Customer may return such product, subject to the following conditions, by calling or sending an e-mail to the Shop and stating the reason for such return within seven days after receipt of the product or within twenty days after dispatch of the product from the Shop’s office (whichever comes first). However, the product can only be exchanged for the same product and not for any product different from the ordered product. If the Customer wishes to return the product because of the Customer’s personal reasons, such as the Customer does not like the product, the Customer shall bear the original shipping costs, return shipping cost and any transfer charges associated with refunding the purchase price. The Shop will not accept any returned products that are not properly packaged and affixed with the correct postage. Shipping costs within Japan and back to the Customer are free of charge if the manufactures evaluates the warranty claim to be valid. Intentional or accidental damage due to neglect or improper packaging by the Customer are not covered under the warranty and, where this is found to be the case, the product will be returned to the Customer at the Customer’s cost. If the payment was made by credit card or PayPal, the payment shall be refunded to the Customer by the Shop’s payment provider or by PayPal, as the case may be, in accordance with their respective terms and conditions. The governing law of these Terms and any contract formed under these Terms is the law of Japan, excluding its choice of law rules. The Customer and the Shop agree that the Tokyo Summary Court or the Tokyo District Court shall have exclusive jurisdiction and that any lawsuit arising between the Customer and the Shop related to the Service shall be submitted to one of those courts, as the case may be.